While in prison he developed this system of training that uses only pure body weight exercises, something he calls “old school calisthenics.” The goal is to help a person build real functional strength, not just to “get buff” in order to look good. The thing I like best about the book is that you can start the exercises from whatever level you are at. When you look at the cover and skim through the book, it can be a bit intimidating when you see a prisoner in boots and jeans doing a one arm handstand push-up, something there is no hope of me ever achieving, not in this life or the next. However, once you realize that just represents the pinnacle of what can be achieved through “Coach” Wade’s practices, it makes a lot more sense. Here is an example of one of the exercises. In fact it is the first real exercise in the book: Wall Pushups. You start out facing a wall, put your hands on the wall and do push-ups just as you would on the floor. Anyone can do this and you can adjust your feet further or closer to the wall to make it easier or harder. So, this is a starting point. Then he gives 12 Variants of the Pushup such as Diagonal, Jacknife Pushups and Superman Pushups which one can add to your routines when you get bored, need something different or just want to test yourself in different ways. The important thing is to understand the progression he takes the person through from a simple wall pushup all the way to eventually doing a one-arm pushup. The progression is different for everyone. Many people might never reach the one-arm pushup level, myself included. Not these days anyway. The point is, there is always a new goal to work toward. 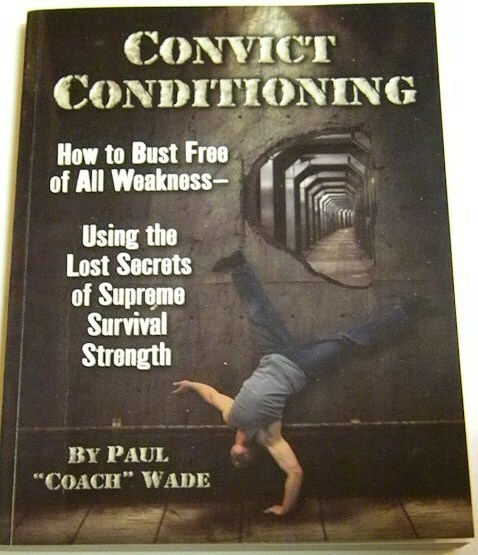 The exercises within “Convict Conditioning” are separated into those six sections listed above. The exercises for each section start out simple and progress to a master level just like in the Pushup example above. This book and “Coach” Wade’s philosophy is anti-establishment, it is not conventional. 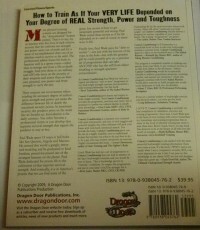 This is not your mom’s “get fit quick” book. But just imagine if you were locked in prison, in a cell for 20 years, or even life and you are in a place where the smallest sign of weakness is taken advantage of. These are the conditions under which these exercises were put together. They are the exercises that kept “Coach” Wade alive and also what made him into the person other prisoners called “Coach” and came to for advice on physical fitness. To close out, I want to leave you with how “Coach” Wade ends the book as it reflects his attitude about fitness and the contents of this book. If that somehow resonates with you, then this book is probably for you. There is a ton of knowledge in this book, it is not just a book of exercises. From the school kid to the grandparent to the professional athlete, anyone interested in maximizing their body’s strength and fitness potential can benefit from this book if it’s lessons are applied. 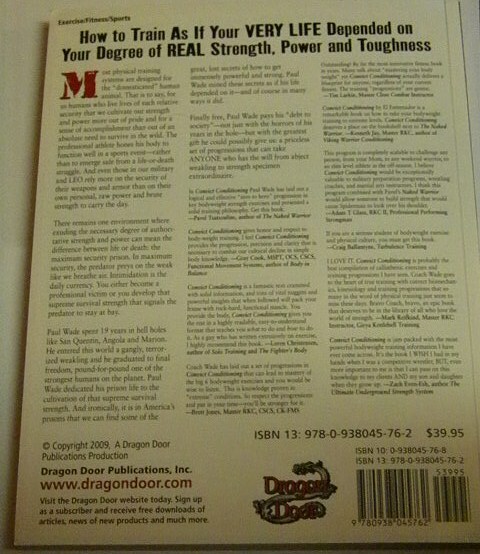 You can read more about “Convict Conditioning”, Paul “Coach” Wade and order your own copy at www.dragondoor.com.